Graze Reviews: Is This Snack Subscription Service Worth It? Graze is a subscription snack service that provides you with eight unique, good-for-you snacks per box for $13.95. Graze Review: Is This Snack Subscription Service Worth It? Graze is a subscription snack brand that promises to provide you with healthier munching options than the office vending machine. The company will send you personalized boxes of snacks on the schedule you specify, and they use your feedback to tailor future snack deliveries to your preferences. They also offer options to buy their food a la carte from the Graze store. The company began in the UK in 2007 when seven friends decided to address an opening in the snack market for healthy options delivered directly to customer’s doors. By 2011, over 100,000 subscribers received Graze snacks each week, and the brand now sells throughout the United States. Will Graze curb your snack cravings, or are you better off with a different brand? Let’s dive into the details so that you can make the best buying decision for your needs. At the time of writing, Graze offers over 200 packaged foods on a rotating basis. Their website states that Graze is committed to providing products made without artificial colors, flavors or preservatives. Each snack is also served in a portion-controlled bag that makes calorie tracking simple. The Graze subscription process begins when you create an account on their website. We can’t speak to the company’s current deals, but at the time of writing new subscribers could receive a mini snack-pack for free ($1 shipping cost), which contained four snacks. These boxes (and the standard eight-snack ones) are designed to be small enough to fit in most mailboxes, and they are free of frozen or perishable ingredients. 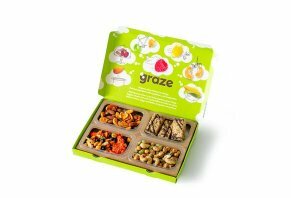 All snacks are packed by Graze, rather than being redistributed from another supplier. Signing up for a Graze sample automatically enrolls you in the monthly subscription program. Once you try your sample pack, the company wants you to log into your account and specify whether you ‘like,’ ‘dislike,’ or ‘love’ each variety. From there, you can decide how often you want to receive a box – monthly, bi-weekly or weekly – and specify if you want a specific type of box. The options at the time of writing were Protein Boxes (only snacks with a high protein content) and Calorie Count Boxes (each snack serving is under 150 calories), a few of which we’ll describe in detail a little later. After you specify your preferences, Graze will send you new foods to sample in their standard eight-snack box. You can rank each variety online so that each subsequent delivery better fits your preferences. The company promises not to send you anything in your dislike category, so the more thorough you are with your rankings, the better chance you will like what you receive. These rankings can be adjusted at any time if your tastes change. Note: Graze doesn’t allow you to select the snacks in your box. If you want to guarantee that you receive a specific item, you will need to order it a la carte from the Graze store. Regular Graze subscribers can earn reward points for making a la carte purchases and reviewing snacks on their website. These points can be used to offset the cost of the subscription, though the company website states that the number of points you receive per purchase or review is subject to change. You can check out the current exchange rate in the Reward Points section of your account. At the time of writing, an eight-pack of Graze snacks cost $13.99, which comes to just under $1.75 per snack. The a la carte snacks within the Graze story vary from about $3.99 to $8.99 each. You can pause or cancel your subscription through your account page. So long as you cancel before that month’s cut-off time, you won’t be billed again. Each subscriber’s cut-off date is different, and you can view yours within your account. Further questions should be directed to Graze’s customer service at getintouch@graze.com. What Are Graze Snacks Like? At the time of writing, Graze offers over 200 healthy snacks. All options are vegetarian-friendly, and only three at the time of writing (salted fudge peanut cookie, chocolate pretzel dippers, and lemon drizzle flapjack) aren’t suitable for vegans. The company makes it clear that their dried fruit is free of sulfur dioxide and refined sugars, and that they rely on fruit juices to sweeten tart berries. As all the snacks are packed in the same facility, Graze subscriptions aren’t suitable for people with severe allergies to gluten, eggs, soy, milk, nuts, fish, sesame, and peanuts. A small sampling of available snack options is below. Honeycomb Flapjack Multipack: These rustic, rolled oat bars have a honeycomb and chocolate drizzle, and their gooey texture makes them Graze’s seventh most popular snack. They are advertised as an ideal complement to an afternoon cup of coffee. Chocolate Pretzel Dipper: This snack pairs pretzel sticks with a chocolate hazelnut dip for 150 calories per container. It’s supposed to help you kick the sugar cravings without giving into a candy bar. Dark Chocolate Cherry Tart: Combing Belgium dark chocolate buttons with cherries and almonds, this snack strives to balance sweet, juicy, and crunchy features together in a fiber-rich treat. Chinese-style Honey Sesame: A blend of sesame and chia coated peanuts with wild rice sticks, edamame, and black pepper-seasoned almonds. Peanut Butter and Cocoa Mini Protein Balls: Peanut butter, cocoa, date paste, and Himalayan salt meld together in these protein balls that offer snackers a satiating snack. Many Graze snacks are also available for purchase in retail locations across the United States and the U.K. You can use your zip code on this page to determine which stores carry snacks near you. What Do Customer Reviews of Graze Snacks Show? How well do Graze snacks perform in the real world? We looked through online customer reviews to find out. Lifestyle blog Winstead Wandering’s founder Abby Winstead tested Graze for a few months and found that the service made sense for her lifestyle. She appreciated the variety of ingredients used, many of which were otherwise difficult to find locally. Winstead also noted that the pre-portioned containers made it difficult to overeat. Even so, she thought the price tag was high per serving, though relatively comparable to the cost of the vending machine at work. Additionally, Winstead found the rating system cumbersome, as she needed to scroll through hundreds of snacks to ensure she ranked all the ones she wasn’t interested in trying. At the time of writing, there’s no way to sort Graze foods by ingredients. A review from PCMag.com came to similar conclusions. The reviewers appreciated the freshness and flavoring in each snack they sampled and found the pre-portioned packs to be convenient for busy lifestyles. However, we noticed that multiple consumers were frustrated by Graze's customization process because it was time-consuming, which means that, if you're looking for a set-it-and-forget-it type of subscription, this one could frustrate you, too. We created this chart to produce a meaningful comparison to Graze and two competitive subscription snack brands: NatureBox, HealthPak, MunchPak, and the Yummy Bazaar World Gourmet Subscription. Looking at the details, it’s clear that Graze offers a lower price for their snack box than the competition, though the serving sizes tend to vary more for brands like HealthPak and MunchPak that don’t package their treats to standardized portion sizes. NatureBox used to offer a subscription service similar to Graze, but they now use a membership program that lets you select the exact number and variety of snacks you want. While this is likely a benefit for picky eaters, it might take some of the fun out of trying new snacks. From what we’ve found about Healthpak snacks, they tend to be geared slightly more towards people who are trying to lose weight. Even so, they don’t offer standardized serving size which might make them somewhat more difficult to eat for a midday snack. One thing that differentiates brands like HealthPak, MunchPak and Yummy Bazaar from Graze and NatureBox is that they aren’t selling their own branded goods but rather offer a curated collection of existing products. This can be an advantage if you’re looking to learn about new brands you can buy elsewhere, as it means you aren’t restricted to shopping only with the subscription box provider. In the same way, MunchPak and Yummy Bazaar are targeted more towards people who want a snacking adventure, rather than a way to beat off fatigue in the middle of the workday. If you primarily want to invest in snacks that serve as fuel (not just fun) then Graze or HealthPak might be the better way to go. From our research, Graze offers a unique subscription service for securing health snacks at home. Users can choose the frequency of deliveries and give the company feedback about their snack hits and misses to curate a more tailored eating experience with every box. You’re likely to spend more per serving than at the grocery store, but the reviews we read showed that many people didn’t mind because they appreciated the unique flavor options and pre-set serving sizes. Who is Graze best for? The target demographic for these snacks seems to those who crave something different yet healthy for their snack routine but don’t want to deal with varying serving sizes. If this sounds like you, signing up for a sample might be a smart idea. However, it’s likely not the best service for people who prefer to eat the same snacks for several days or want to receive more than just one serving of each one. It’s also not a good option for those with allergies, as all the snacks are processed in the same facility. Write a Review for Graze!